Transitional House is a non-profit housing program that provides short-term affordable lodging with minimum support to 16 single adult men. The facility offers a fresh start for men seeking to achieve a successful transition from the streets to community living. At Transitional House, the men pursue independent living, develop socialization skills and learn how to live within their means. A good number of our clients have backgrounds that include homelessness, addictions, incarceration and mental illness. You must fill out a written application if you would like to become a resident. You will be interviewed by the Transition House supervisor after you submit your application. The maximum stay at Transitional House is one year. – be a good fit with the rest of the client population. If you are accepted, the supervisor will explain and give you a list of the “House Expectations,” regarding your behavior. He will also inform you about the rent and how it is to be paid. Transitional House is located at 1167 Gladstone Avenue, close to a variety of amenities and services, including bus routes. It was inaugurated in 2004. It is composed of two near-identical dwellings, joined together at the common front entrance to the building. There are eight bedrooms on each side of the central divide. Each resident is provided with a private, furnished room, under lock and key. Bathrooms are shared one for every two residents. There is 24/7 on-site supervision with staff trained in crisis intervention. In short, you will make your own choices with supports. Supports include assistance, if needed, in cooking, cleaning, budgeting, job search, furthering education, finding doctors – anything that impacts day-to-day living. 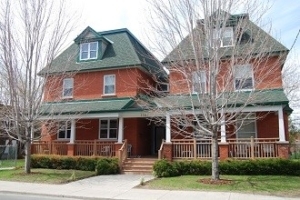 The house is located in a residential setting in Hintonburg at 1167 Gladstone Avenue. 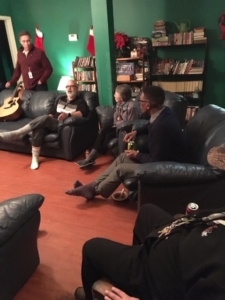 For the clients, the stigma of coming from a homeless background is all but erased in the fellowship of sharing and co-habiting with 15 other residents. We have become fully integrated within the community. For the local community association we are the prime source for the recruiting of volunteers. We maintain excellent relations with the neighbors. Steven Ridgley is the supervisor of Transitional House (TH). Three Front Line Workers also work there. You may telephone us at 613-724-2300 for more information on TH.